We were wandering down the streets of Barcelona one day, when we came across an interesting deli. They specialized in international cuisine. Specifically, the shelves were divided up into sections by country or larger geographical region. Each section was filled with gourmet items (at least they had gourmet prices) that reflect the local cuisines of the regions. For example, the Greek shelves were lined with olives and olive oils. Spain had tapenades. Japan had nori, sushi rice, and wasabi. Thailand had spring roll wrappers and fish sauce. India had curries. Morocco had couscous. You get the point. 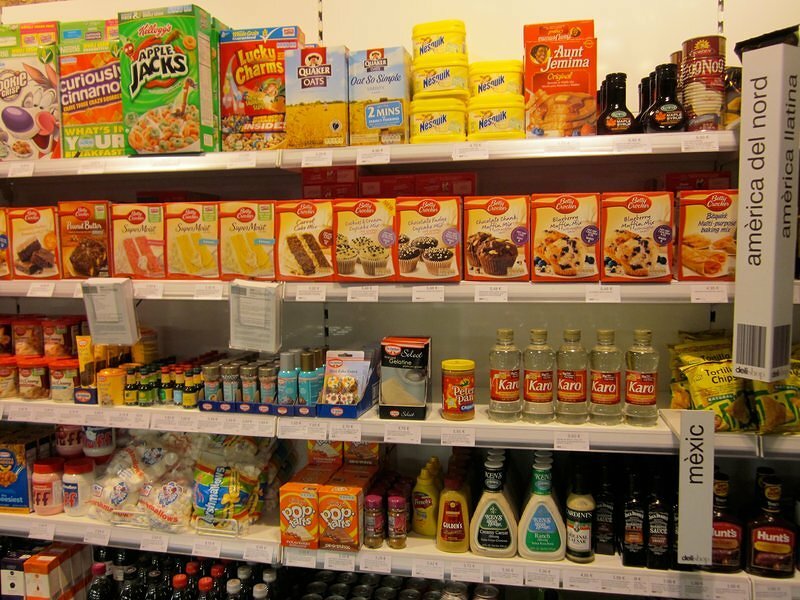 In each case, the foods stacked on the shelves gave you a good picture of what the countries known for. You didn’t even need to look at the signs to know what region you were looking at. And, in general, the foods were whole, wholesome, and healthy foods. And then there was North America. What do we have? Corn syrup and a ton of pre-mixed, processed, ready-to-make items. We were not allowed to take photos in the shop, but I managed to snap this one just as the sales lady wagged her disapproving finger at me and I shoved my camera back in my bag. While I think the items in the snapshot above are an honest and accurate reflection of North American “cuisine,” it doesn’t stop me from being ashamed of that fact. Hopefully, the picture of North American food will change for the better and soon. Our lives just may depend on it. Pretty pathetic isn’t it? We were just at the market yesterday checking out other people’s carts as we waited in line. Carts overloaded with sugary soft drinks, chips, white bread and nearly zero vegetables. And they wonder why most Americans (and Canadians??) are overweight, out of shape and in generally bad health. We’re starting a 6 day juicing diet again next week and look forward to relishing the odd looks from other shoppers as we unload our cart full of vegetables! Yep, Canadians fall into the overweight category with Americans. Good luck on your juicing diet. We notice right away when we haven’t been eating enough veggies.